Some of you may know that I used to be a zoo keeper. The majority of my ten years as a keeper was as a primate keeper. I worked with various species of monkeys and apes during my time as a keeper and during that time I participated in hand raising several orphaned primate babies. These are thrilling experiences that my surrogacy as a non-human primate caregiver provided me with the experience I now refer to with my two human children. It occurred to me the other day while caring for my baby, that I have more experience raising non-human primates than I do humans. I have raised more monkeys and a chimp (chimps are apes, not monkeys), than I have kids. I have two kids, but have raised no fewer than ten primates. They are similar experiences, but just slightly different enough that I find I catch myself from innate behaviors I could use with the infant primates. It makes sense then that my instincts tend toward my experiences hand rearing primate babies. My most ingrained reaction is to give a crying and flailing human baby a stuffed animal upon which to cling. Yes, I am typically that reassuring thing to which to cling, but when I’ve set the baby down in his crib or bouncer, his little arms flail out and he screams. When hand rearing infant primates (non-human primates) a surrogate upon which to cling must be provided. Yes, I as the caregiver, am a surrogate, but humans hold their babies and even put them down. Non-human primates are not removed from the clutches of their mother’s hair for many weeks. 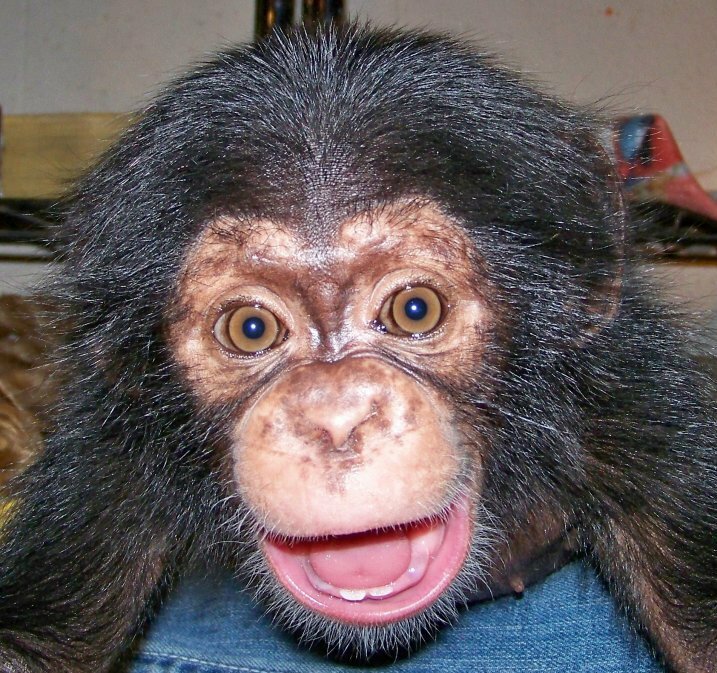 The first non-human primate I ever raised was a capuchin monkey named Noah. I’ll never forget my first day of training as a tour guide at a small zoo in Oklahoma. We sat gathered around, meant to be listening and taking notes, but all attention was focused on a small monkey bouncing around a small cage. He was a few months old, but had the energy of a toddler overdosed on sugar. Occasionally, he would return to a stuffed animal and would attach himself to it for comfort. Seeing a lost cause, our trainer removed the monkey, attached to his “fuzzy” and introduced him as Noah. 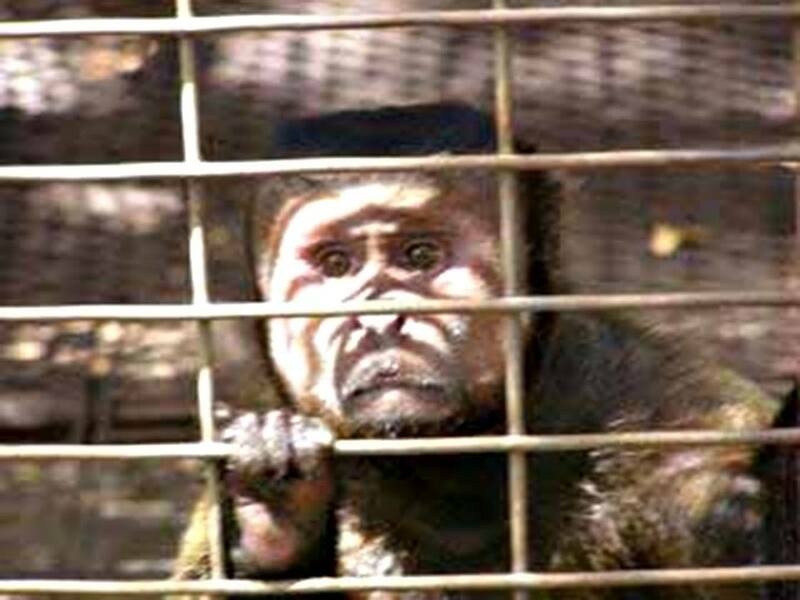 He had been rejected by his mother and was being hand raised by the zoo staff. I was entranced, as you would imagine, and though several people tried to touch him, I refrained. Don’t get me wrong, I was dying to. I had wanted to be a primate keeper since I was three years old and my aunt got me a stuffed monkey named Spunky the Monkey(I still have him). I don’t know what stopped me. As an animal person my entire life, instinct told me to wait, get to know him. We became fast friends and years after I left that little zoo, he would scream excitedly as soon as he saw me upon my return. He had grown to be aggressive to most of his keepers and they had trouble shifting him. If I was visiting I could get him to comply. Noah was my second primate love (Spunky was my first). I assisted in hand raising several capuchin monkeys, but my dream was to work with chimpanzees and hopefully one day get to hand raise one. N0w, that was a conflicting wish, because I knew that to hand raise one would mean something had occurred to require the hand rearing, like the neglect of the baby, or death of the baby’s mother. When I finally got on as a great ape keeper at the zoo I grew up visiting, I thought I had won the lottery, though I had worked very hard to get there. Wouldn’t you know it, the chimpanzee group’s alpha female was pregnant. I was of course hoping for a healthy pregnancy and delivery, there was no reason to believe that the female would not take care of her baby. Tragically, though, the mother died in child birth after extensive efforts to save her. 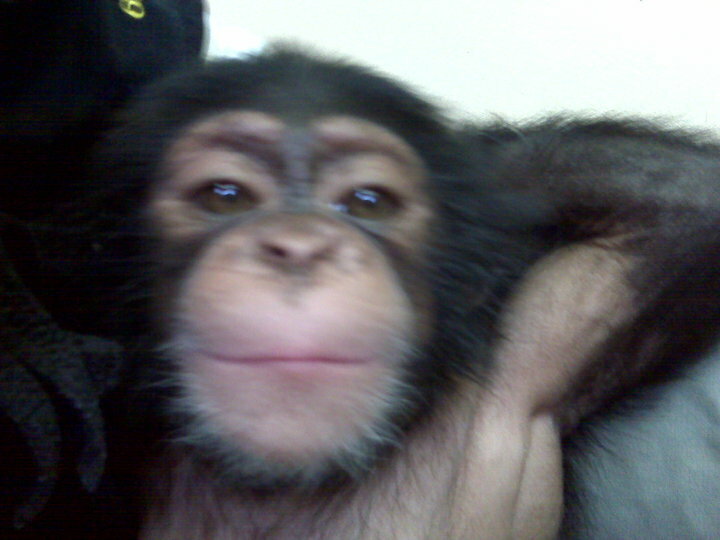 So there I was at my dream job, part of the team hand raising a newborn chimpanzee. When I was part of the team that hand raised the infant chimpanzee, we used a t-shirt covered in fleece strips, sewn all over the t-shirt. This provided the infant a way to learn to cling since the baby was to be introduced to a surrogate in the chimpanzee group as soon as was deemed it appropriate for the infant’s health, safety and well being. We provided her round the clock care. To watch her grow and progress through her developmental skills was my first experience with motherhood. I remember her a scrawny newborn, so weak and vulnerable. She was getting sick a lot, so we had to administer intramuscular shots in her tiny little leg muscles, take her temperature hourly and count her respirations. To take her off of you to perform these necessary procedures was agonizing as she would scream to be reattached. I would press her back to my chest as quickly as possible and she would snuggle into the felt strips in my chest. I remember thinking that I couldn’t wait for her to be a little less vulnerable. It’s striking the similarities in the emotions and reactions when my sons were newborns. It’s such a stressful time and so overwhelming. Unlike raising a chimpanzee baby, there were no shifts to hand the baby off to the next keeper with my kids (unless you count my husband, which I rarely do for some reason, though he’s raised four children to adulthood). I find I celebrate their milestones the same I did for the baby chimp. I remember when she got her first tooth and acclimating to seeing her with teeth. I remember working with her when she was army crawling. I used the same exact technique in encouraging her to crawl as I later did with my oldest son (number 2 isn’t army crawling just yet). I would lie her about four feet from me and she would drag herself across the blanket, unsure and chirping, as she kept her eyes on me. She would work hard, making her way back to me and I would scoop her up and hug her, telling her good job and vocalizing as closely as a could as to an encouraging chimpanzee vocalization. My son, the same exact procedure, without the chimpanzee vocalizations, though, believe me, I was tempted. As she got older, she would hang onto my thumbs and flip backwards, laughing that toothy, wide mouthed chimpanzee laugh. Now my oldest son holds my hands and flips backwards, and the laugh is similar. I would celebrate her little accomplishments, each new milestone the same as I do with my boys. I would cuddle her and stroke the hair on top of her sweaty head as she slept against me, same as I do with my boys. But there are differences, of course. I don’t have to give my sons back to their kind, not yet anyway. I am their kind, but I do have to let him get progressively more independent, until he leaves the nest. We had to introduce our little chimpanzee back to the group, to the chimpanzee surrogate who would be her mother and protector. It was fascinating to watch that transition into the chimpanzee life she was meant to have. She was more than a little spoiled, despite our best efforts. The original female we believed would be a suitable surrogate did not work out. She was interested in the baby, but only as a novelty, something of an aunt, if you will. The chimpanzee that took the baby as her own happened to be the baby’s deceased mother’s best friend. Yes, that is the best way to describe them. She was a bit cantankerous with her keepers and an alpha, after the baby’s mother died. She was very stern with the baby, but never physically so. The baby was used to getting away with biting and fussing at the people she didn’t want to hold her or touch her, or when she just plain didn’t want to do something. This is a much more painful type of tantrum then with a human child. At 6 months old she had the temperament of a human toddler and the strength of a teenage human. Her surrogate wasn’t having it though. She would walk behind the baby and just touch her, clip her back foot. The baby would turn around and scream at her, like to leave her alone, even bite at her, but the surrogate would continue and the baby would stop griping at her eventually. Then her surrogate would walk away and give her space. Then, she’d do it all over again. Where we would have given her space, a little taken aback by the rejection, her surrogate, being an alpha, essentially told her, I’m the head chimp in charge, you don’t get to send me away. She ended up being a fantastic surrogate mother, even biting off half the ear of a male who she thought got too close to the baby. Poor guy was posing no threat or even aggression towards the baby, but the surrogate thought so, and she being as big as most of the males, let him have it. She has since been surrogate to orphaned babies from all over the country. 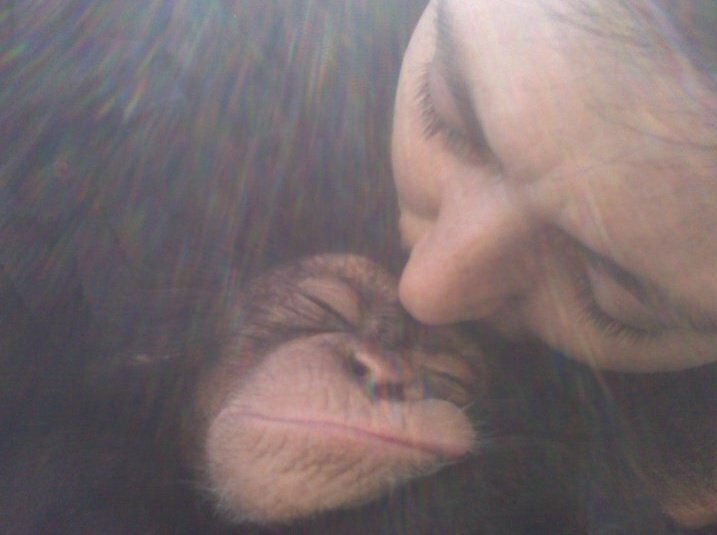 I learned so much from raising primate babies and watching them be raised by their own species. I apply the lessons I learned almost every day in my parenting and find myself playing with my babies as I did them. I don’t know what kind of mom I would be if I hadn’t had these experiences. How lucky I and my kids are.